The Year of the Horse is approaching! The Year of the Horse is approaching! 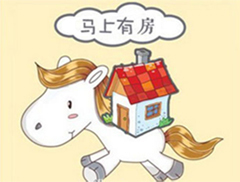 2014 is the Year of the Horse according to the Chinese Zodiac Calendar. When the Chinese begin celebrating the Chinese New Year, they will be sending more and more New Year wishes and blessings to their friends, colleagues, and family. Among the hundreds of styles used to express these best wishes, one way has become extremely popular among Chinese people, especially the young people, that is to say “马上有……(mǎshàng yǒu…)” such as “马上有钱(mǎshàng yǒu qián),” “马上有车(mǎshàng yǒu chē),” “马上有红包(mǎshàng yǒu hóngbāo)” etc. “钱(qián)” means money, therefore, “马上有钱(mǎshàng yǒu qián)” means someone will become rich very soon. Because of the double meaning of “马上(mǎshàng),” “马上有钱(mǎshàng yǒu qián)” can be vividly shown using the following picture. Zhù dàjiā mǎ’nián mǎshàng yǒu qián! 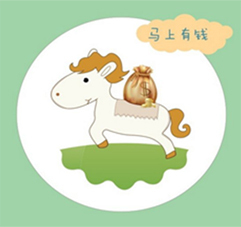 马上有房(mǎshàng yǒu fáng)Hope everyone will immediately become rich in the Year of the Horse! “房(fáng)” means “house” in Chinese. In China, buying a house is a great burden for many Chinese people because of the rising housing prices; therefore, it is propitious and thoughtful to wish people to have their own house very quickly in the upcoming New Year. Wáng Xuě, zhù nǐ xīnnián kuàilè, mǎshàng yǒu fáng! 马上有对象(mǎshàng yǒu duìxiàng)Wang Xue, happy Chinese New Year! Hope you have your own house very soon! 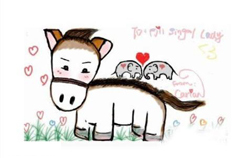 In the above picture, we can see a pair of elephants are on the back of the horse, which means “马上有对象(mǎshàng yǒu duìxiàng)” in Chinese. “对(duì)” means “a pair,” or “a couple,” and “象(xiàng)” means “elephant.” “马上有对象(mǎshàng yǒu duìxiàng)” literally means “a pair of elephants are on the back of the horse.” However, besides meaning “a couple of elephants,” “对象(duìxiàng)” also means boyfriend or girlfriend. Therefore, “马上有对象(mǎshàng yǒu duìxiàng)” actually means someone will find his or her beloved when the New Year arrives.